Averaging around 13-14 hands high, Icelandic horses aren’t exactly giants amongst equines. However, these Nordic beauties have enabled Auckland couple, Kenneth Husted and Snejina Michailova, to build a thriving business. Waiting tables in a busy bar is no easy business, but it can be tackled at a canter compared to slinging suds on horseback! Kenneth Husted, from Neðri Bakki Icelandic Horses Stud, says, while some horses may be quicker, and others are stronger, few are as ‘stable’ as his favourite mounts. However, it’s best not to request that an Icelandic horse halt, should it slip into a different gear entirely! The result of a unique gene, tölt is an additional four-beat gait where at least one foot is on the ground at any time, making for a pleasant, stable ride, Kenneth explains. 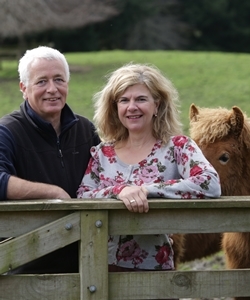 After falling in love with New Zealand during an academic sabbatical, Kenneth and Snejina (both now business professors at The University of Auckland) emigrated from Denmark in 2005 and settled in Bucklands Beach. While Kenneth practically grew up in the saddle, it wasn’t until the family moved to New Zealand that Snejina came to share his passion and a new business was born. Considering the couple’s occupation, establishing Neðri Bakki was the logical next step. In addition to providing training, the business supplies tack – Icelandics require special saddles. While no extra expense or set up is required above that for other breeds, those looking to purchase should first talk to a certain local man about these horses. Icelandics are thought to have originated in England, where they became extinct. Introduced to Iceland in (approximately) 900AD, the strain enjoyed unrivalled protection. In a land where crops were difficult to cultivate, which also lacked roads, their smaller size (therefore, appetites) and gait were well suited. By banning the import of horses, the business savvy Vikings not only secured a monopoly, but prevented the spread of disease and kept their equine gene pool unsullied. Although the first recorded sale of an Icelandic horse in New Zealand occurred in 1868, it was not until the 1990s that a breeding programme actually began here.